I woke up pretty early Saturday morning. Mornings are not my friend, so normally it takes at least two snooze sessions to get me out of bed. But the morning of February 11, my eyes popped open the second my iPhone “ripples” alarm went off. I tried to eat something. My stomach was in knots. Even choking down a protein bar was a challenge. My hotel room had a microwave, so I made myself a cup of herbal tea. 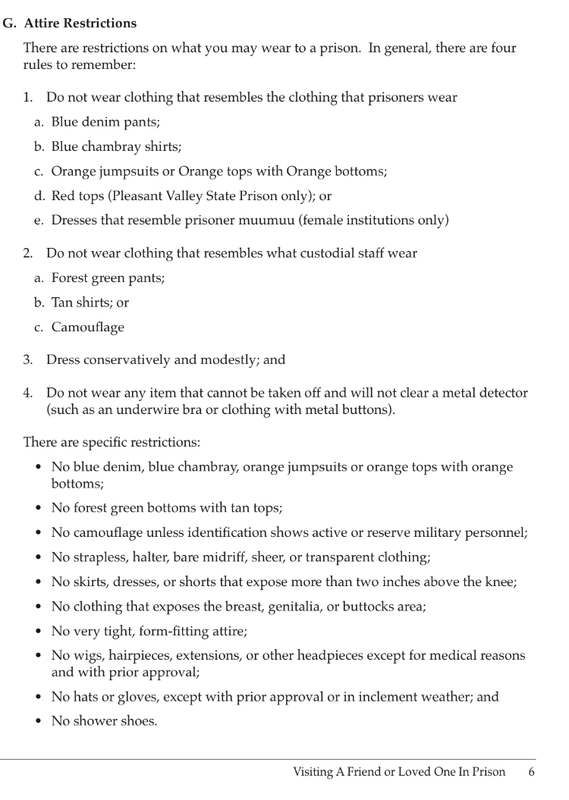 I’d planned my outfit before I even left Orange County, but I was still nervous about all those San Quentin apparel rules. I had on grey pinstripe pants, a light blue button-down shirt with tiny white polka dots, and a black cotton cardigan sweater. I made sure to wear a bra without an underwire (like I need a bra that supportive anyway). I also checked that my shirt wasn’t see-through. My visit was scheduled for 9:00 am. I gave myself ample time to get from my hotel to the prison. After my practice run the day before, it only took about fifteen minutes to drive there. I was parked in the visitors’ lot by 8:30 am. The lot was busier than the day before, but it wasn’t a madhouse like I’d feared. 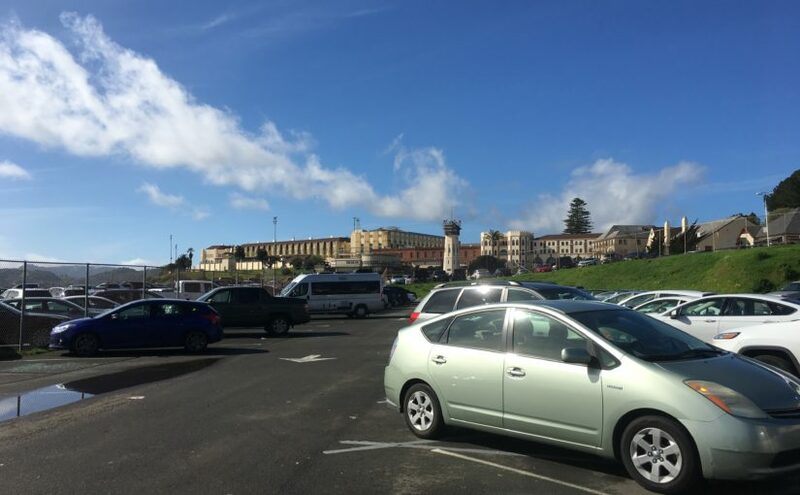 Considering that San Quentin State Prison can house over three thousand inmates, I expected the place to be packed on a Saturday. There were about two dozen people standing around, or sitting on the wooden benches. About ninety percent of the visitors were women, and a lot of them were probably moms of inmates. I did not envy them visiting their sons at San Quentin. I sat in an empty spot on the bench closest to the entrance and asked the women sitting nearby if this is where you wait when you have an appointment. 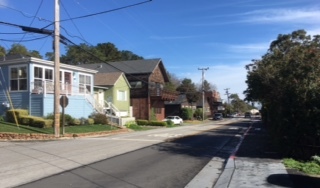 One woman nodded and smiled. Another told me she liked my hair. I thanked her and made a comment about all the clothing color rules and how I was happy that didn’t apply to hair. The women laughed (yup, that’s where I got the idea to write that in the last post), and the four of us started up a casual conversation. The lady sitting next to me leaned closer and gestured toward a young woman standing against the wall. “She’s never going to get in with jeans,” she tisked. The place started filling up with more visitors, and I wasn’t sure what I was supposed to do next. Along one wall were two glass doors an equal distance apart that led to the check-in room and metal detector. Even though the doors went into the same room, it appeared that each door had its own check-in station. The doors were locked and could only be opened when a guard pushed a security buzzer from inside the room. The door would buzz; a visitor would open the door and go inside. How anyone knew it was their turn, though, was beyond me. 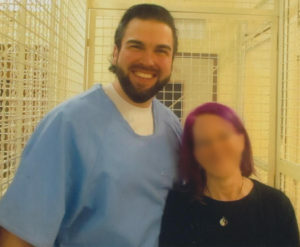 I put out a general inquiry to the women around me, asking if they were also visiting condemned prisoners. 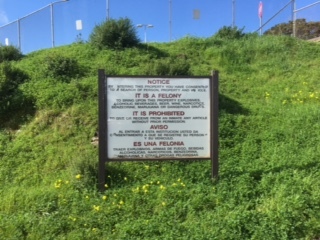 This seems to be the official term used in San Quentin correspondences when referring to death row inmates. I wonder if that sounds any less threatening? It turned out they were all visiting general population inmates and I was sitting on the wrong end of the building. I made my through the people and past the doors to the death row visitors’ section (no wristband needed), and noticed there was an invisible line of division between the death row visitors and everyone else. It was less crowed at this end and it looked like one of the doors/check-in stations was designated for death row only. She nodded and asked my appointment time. She was also scheduled for 9:00 am, and she explained to me how the process works, for which I was extremely grateful. It reminded me of when I used to help other visitors at the OC Jail by explaining the workings of the lockers. Oh memories. Within your time slot, you check in by order of arrival. The first person to arrive with a 9 am appointment, for example, is the first person to be checked in during that appointment time. It’s up to the visitors themselves to keep track of the order. “Hit the town makeup” was the first 9 am to arrive that morning. It turns out you are actually supposed to arrive 30 minutes before your scheduled appointment. I was informed that the prison was running uncharacteristically late that morning, and the 8:30 visitors hadn’t all been checked in yet. I was used to visits running late from going to the OC Jail. I wasn’t bothered. That was the norm. I found out later that Daniel had started to worry when it got to 9:15 and I hadn’t shown up yet. He’d gone to ask one of the guards to take a look outside for me, but realized he didn’t know my current hair color. Now that I was finally in the correct waiting area, there were four women ahead of me for the 9:00 time. The one who was supposed to be second said she’d noticed me when she got there earlier (the hair color again), and that meant I’d arrived before her. So everyone agreed that I would be the second 9 AM visit to check in. There might not be honor among thieves, but there is honor among inmate visitors. When it was my turn, I couldn’t seem to muster the hand/ear coordination it took to pull open the door when the buzzer sounds. After my third attempt, someone else opened it for me. On visiting day two, I handled the door fine. On that first day though, I was still nervous about getting through security. I’d already seen one woman have to come back out two times because of the number of keys on her key ring. She finally just put her keys in a locker. She was allowed to take the locker key in. I’d taken my car key off my key ring at the hotel. That was the only key I had on me. It was inside a clear plastic sandwich bag alongside my driver’s license, a small comb with no handle, and twenty-five dollars in quarters and singles. You’re allowed to bring fifty dollars, but I didn’t think I’d need that much in the way of vending machine food. You can also buy photo tokens for two dollars from a machine next to the check-in. Daniel told me he’d already ordered tokens, so I didn’t need to get any this time. I saw a couple of women carrying clear plastic purses instead of sandwich bags. I’m going to look into getting one of those. The guard looked at my driver’s license. A second later, he handed me a print out with Daniel’s picture and his information on it. There was also general name and address information about me. Then, the guard looked at me and pointed at my head. “Yikes. I’m so lame,” I sputtered because I’d completely forgotten about them after pushing them up on my head when I came inside the building. My fair skin immediately flushed like I’d just downed a double shot of chilled Patron. “They’re pretty cheap. I can throw them away if you want.” I pulled the sunglasses off my head and headed toward a large trashcan. The guard chuckled and pulled out a small plastic basket that contained a few other forbidden items. A pen. A cell phone. I remembered that Daniel told me his mother had to take the bobby pins out of her hair. I placed my sunglasses in the basket and thanked him for not making me go back to put them in a locker. He told me I could get them on my way out. I went over to the x-ray machine and stuck my sandwich bag in a plastic bin. It headed down the conveyor belt to be thoroughly examined. For my first attempt through the metal detector, I’d forgotten to take off my shoes. I was wearing Doc Martin Mary Janes with the big silver buckles, which obviously set the buzzer off. After swiping the wand over me, and discovering my shoes, the guard started to laugh. He was the second one to find my antics amusing, and he wouldn’t be the last. I took off my shoes and put them on the belt to follow my coin and comb bag. I cleared the metal detector on my second go, and I balanced on one leg and then the other to put my shoes back on. Oh well. The stamp is obviously another measure to insure inmates don’t escape. 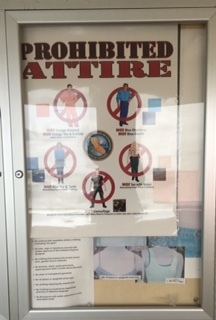 I guess an inmate and a visitor could attempt to trade clothes during a visit. This was not a concern with Daniel and me. The two of us wearing each other’s clothes is more of a hilarious mental picture than an actual escape threat. I’d made it through prison security and was pointed toward an exit that leads back outdoors. 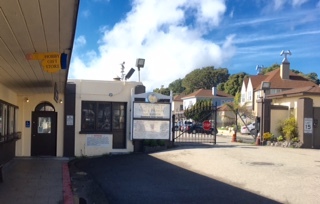 Even though I was just a few feet from where I’d entered the visitors’ building, I was now officially inside the gates of San Quentin State Prison. 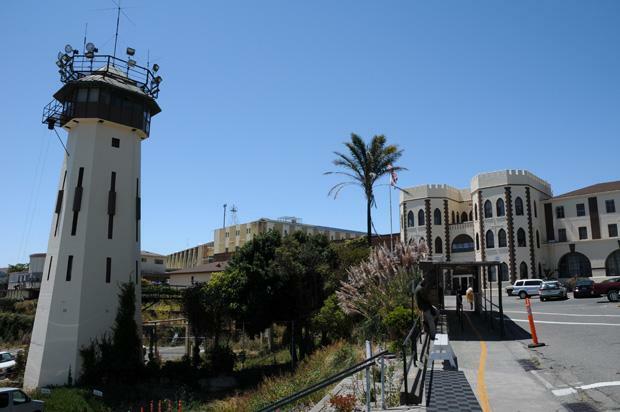 I walked toward the massive guard tower that stands between the prison and the outside world. The sun bounced off its whitewashed bricks. I squinted and shielded my eyes with my hand. I wished I had my sunglasses. My eyes are super sensitive to the light even on a cloudy day, and that day was bright and sunny. The air was crisp and fresh coming off the bay. It was a beautiful day. But I was looking forward to spending it indoors. Locked inside a little cage with my friend, who is a murderer.